Let’s start the Funky Czech-In blog with the probably best known funky Czech song, the soulful Tak dej se k nám a projdem svět (Join Us And We’ll Travel The World). It’s the song that makes Marta Kubišová’s first – and for twenty years her only – solo album appear on so many funk collectors’ want lists. Marta Kubišová, born 1942, was probably the most popular Czech female pop singer between 1965 and 1970. Written by the guitarist Otakar Petřina with lyrics from bass player Zdeněk Rytíř, the song literally kicks off with a funky drum break, most likely played by Petr Hejduk. 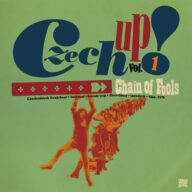 Soon thereafter we’ll get all pop ingredients that were “in” in late 1968 when the track was recorded: a funky bass line, a fuzzy guitar, a swirling organ, a swinging punchy horn section (probably played by members of the Czechoslovak Radio Prague Dance/Jazz Orchestra – TOČR/JOČR) and on top of it Marta’s deep and urgent voice, indirectly reflecting the cheerless situation of the country occupied by Soviet tanks, while offering the listener a glimpse of hope. At the time when Songy a balady has been recorded and released, Kubišová was also a member of the Golden Kids, a vocal trio with Helena Vondráčková and Václav Neckář who were then already pop stars with their own solo albums, too. (Neckář was even starring in the main role in the 1968 Oscar winning movie Ostře sledované vlaky (Closely Watched Trains) directed by Jiří Menzel.) The Golden Kids were extremely popular in 1969 and they also performed in West Germany and in France. Many songs from Songy a balady were actually a part of the Golden Kids live show and both Vondráčková and Neckář sang background vocals on Marta’s album. So watch out for a Golden Kids, a Neckář and a Vondráčková Funky Czech-In post, too. In 1969 Kubišová’s future was looking very bright, she had signed a record contract with Polydor and a couple of her and Golden Kids singles were already released in West Germany. But obviously she went “too far” with her political engagement. In 1970 Marta’s voice has been silenced by the “normalizator” Husák’s regime and all records with her name on the label had to disappear from Czech record stores. You can read more details on a Marta Kubišová fan site in English, including a detailed although not complete discography and a lot of other trivia. Unlike Vondráčková and Neckář, she was not allowed to record or perform in public for almost 20 years, until her appearance at a huge demonstration against the communist regime in November 1989 where she sang the Czechoslovak national anthem and her “signature” song, the ballad Modlitba pro Martu (A Prayer For Marta) [external audio link]. I can remember that while I was listening to her performance live on the Czech AM radio that I had tears in my eyes. And this particular song still moves me, despite the “cheesy” organ sound on the album version (but hey, the original 1968 single version with the Václav Hybš orchestra sounds even cheesier). It’s the message that counts. Marta Kubišová still – or rather: again – performs and records today, all of her recordings are available on CDs. Unlike the original, the 1990 vinyl reissue of Songy a balady isn’t very hard to find in online auctions or in second hand record shops in Prague. If you’re interested, I have four [one] of her 7″ singles from the sixties for sale (items no. 284, 963, 1068 and 1194). On cdmusic.cz you can also buy some CDs, search there for “kubisova”. Also, Songy a balady in the original glorious mono pressing is available on gemm.com. This Marta Kubišová track (“Tak Dej Se K Nám A Projdem Svět”) has recently been used by Boca 45 for “Diego’s Theme” from his Vertigo Sounds album. By the way, last week in Prague I have bought the 1970 issue of Songy a balady with the different track listing as mentioned in my post. But I still coudn’t find out if the very first issue was any different. Both “Zlý dlouhý půst” and “Kdo ti radu dá” are nice soul-beat numbers though, so it’s certainly worth to get this issue as well. HI! I’m from Italy, I have this original LP and the songs “Zlý dlouhý půst” and “Kdo ti radu dá” are included! I’m in the process of writing a book about 1965-1985 rock scene in the former Eastern european countries, if anybody can help I would be extremely grateful because I don’t speak slavik languages and I can’t use most of the internet sources! Cheers everybody from Roma! I’m really enjoying the design and layout oof your blog. Actually just yesterday I have finally installed WordPress on my site and imported this old blog of mine which I have originally maintained via Blogger until they removed the FTP publishing option about 5 or 6 years ago. Then I have in fact just kept the standard “Twenty Sixteen” WordPress theme, and began tinkering with the code. The layout is still just a “quick’n’dirty” hack though. And yes, it’s definitely supposed to be easy on the eyes, hence gray in gray, so that the content stands out.